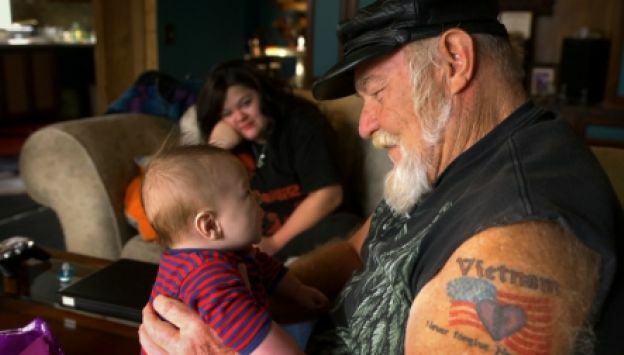 Ron “Stray Dog” Hall, is a Vietnam veteran, a biker, the manager of a trailer park in southern Missouri, the patriarch of a multicultural family and much more. Hall’s wartime wounds are still very raw four decades later; he still experiences chronic nightmares, and he speaks perceptively of the ways in which his combat experiences permanently rewired his brain. The movie follows Stray Dog as he caravans on his Harley from his rural Missouri home to Washington, D.C. with his fellow vets to pay tribute to his fallen brothers at the Vietnam Memorial. STRAY DOG is at once a powerful look at the veteran experience, a surprising love story and a fresh exploration of what it is to be a veteran in the heartland of America.